Christmas crackers are a longstanding holiday tradition in the United Kingdom and they seem to be becoming more and more popular in the states, thanks to savvy bloggers and Martha Stewart. They’re a fantastic addition to any party, Christmas or otherwise, that is so easy to personalize, you won’t believe it. Any color, any filling, any season! 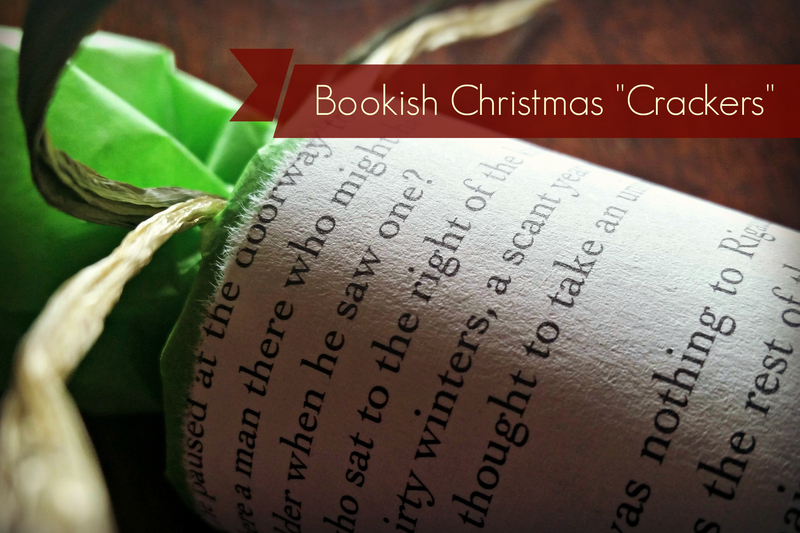 These are, of course, bookish themed Christmas crackers for your December book club party or just the family that loves to read. 1. Cut two pieces of tissue paper to about five inches longer than the width of a roll of toilet paper. Lay the two pieces on top of each other and tape one edge of both layers to the toilet paper roll. Wrap the roll in tissue paper and tape. 2. Pinch the tissue paper at one end and tie close to the end of the roll with ribbon or raffia. 3. 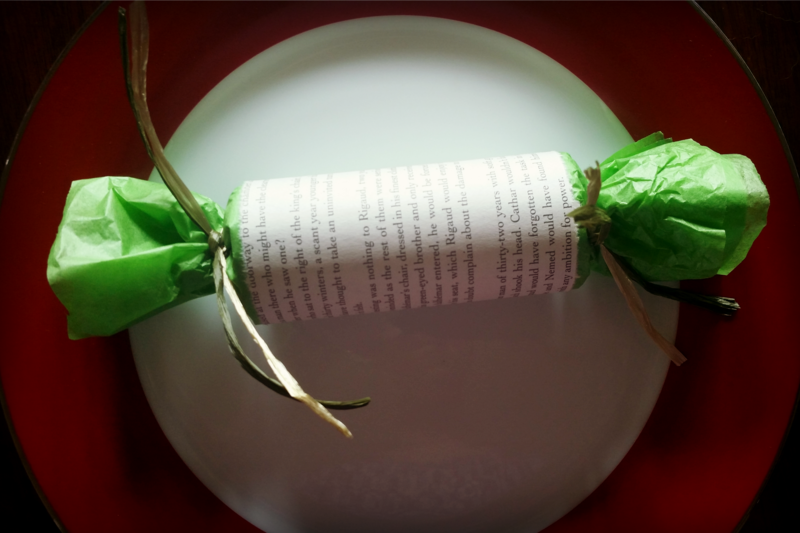 Fill the roll with candies, typed or handwritten book jokes, tea bags and a traditional tissue paper crown. 4. Pinch the remaining end and tie shut with another length of ribbon or raffia so the cracker resembles a tootsie roll. 5. Measure the length of the roll, minus 1/4 – 1/2 inch. Mark the measurement on a book page. Fold, crease and tear at your marks (you can also choose to simply cut the book page at the marks but it won’t achieve quite the same soft, feathered look.) Tape the book page around the roll like a wrapper. Alternatively, to use these crackers as placecards, write each guest’s name on the book page first and then tape it around the roll. What do you fill YOUR crackers with?